The health benefits of goji berries have been recognized for centuries amongst Tibetan and Himalayan monks. 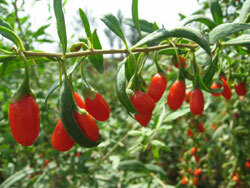 Goji berries are native to China and thrive in other East Asian countries including Nepal and Thailand. This perennial plant grows well in these countries because of the heavy-clay content of the soil . The plant has a lifespan of about 4-5 years and usually begin to bear fruit when it is 2 years old. They can grow in the form of bushes and of vines extending to about 15 feet . Those who consume these sweet, juicy berries immediately feel energetic and more focused than before. This is because goji berries contain antioxidants, B-vitamins and 18 amino acids which are all essential for reducing the amount of free radicals within the body. These free radicals cause fatigue and can potentially damage cells, which explains the revitalizing affects the antioxidants within the berry have . Goji berries also contain more C-vitamins than citrus fruits. C-vitamins are also essential antioxidants that decreases the blood serum percentage of harmful free radicals, such as molondialdehyde, which in turn prevents free-radical induced fatigue and aging . A characteristic about this berry that has recently captured the interest of researchers are its affects on the reduction of hypertrophied and cancerous cells . The chemical component that gives goji this positive affect is beta-sitosterol (also called cinchol). This compound is found in the bright red berries themselves and beta-sitosterol can affectively decrease the size of overgrown cells; In fact it can even induce apoptosis (cell suicide) of tumor cells . Apoptosis is a process during which the body induces cell suicide for dysfunctional or abnormal cells which can potentially cause harm to the body if their replication continues . This property of goji berries makes it a more commonly used treatment for prostate enlargement. After men reach their 40s, the cells of the prostate gland enlarge to a certain extent. When it persists it can develop into a condition called Benign prostatic hyperplasia (BPH). If left unaddressed the enlargement of this gland can cause obstruct the urinary tract thus making urination difficult and, in some instances, painful for older men. In the case of prostate cancer, these cells enlarge and divide out of control causing them to damage normal cells tissues surrounding these abnormal cells. And this can do extensive damage to normal body functioning. Because the beta-sitosterol in goji effectively reduces the size of these swollen cells without serious side affects it is becoming used commonly by physicians . It is used as a precautionary treatment but in patients with cancers, it can be used along with other medications to assist in the reduction of tumor cells (no known drug interactions have been documented for beta-sitosterol). Beta-sitosterol is a lipid (fatty acid) derives from plants. Stigmasterols are naturally occuring plant sterols with a chemistry similar to cholesterol. These stigmasterols can be found in any plant, particularly in high concentration in grains and berries. These sterols can be converted into beta-sitosterol using a condensation reaction with phenyl groups . The biosynthesis of beta-sitosterol in plants occurs when phytosterol esters (a major type of sterol, or lipid, in plants) are broken down by acyltransferase--an plant enzyme that can be isolated for laboratory synthesis as well . Information regarding beta-sitosterol can be found in any chemical database using its CAS registry number, [83-46-5] . 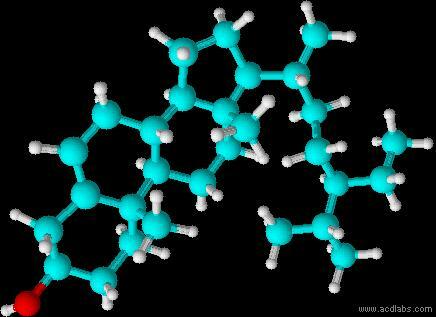 The aromaticity of this compound is reflected in its IR spectrum because of bending in the 1590 and 1490cm-1 mark . There is prominent stretching just before the 3000cm-1 mark which indicated the presence of alkanes.Some stretching can also be noted in the 1300 region which indicates the presence of a Carbon to Oxygen bond . Beta-sitosterols can be isolated from commercial sitosterol products through crystallization and recrystallization in hot absolute alcohol . The final product is a white, odorless powder which is insoluble in water like any other sterol. It must be used while in the liquid phase so temperatures must remain between 139-149oC as this is the melting point for this sterol. Goji berries themselves can be eaten for a daily natural source of essential B-vitamins and antioxidants. However simply ingesting the berries will not provide a sufficient amount of beta-sitosterol unless many are eaten at once (this is not recommended with any fruit, as the fiber contained in the berry may upset the digestive system). The beta-sitosterol can easily be isolated into the form of a powder. This powder can be taken in pills or mixed in with margarine and daily products with dosages of about 1.5 to 3g . Cancer patients can be given 4 to 6 ounces of goji juice daily, however. The only known side affect of goji berries are that they can reduce the absorption of fat-soluble vitamins like beta-carotene, alpha-carotene, and vitamin E. Accompanying vitamin supplements with beta-sitosterol could reverse these affects, however. Goji berries can be incorporated into one�s daily lifestyle for maintaining good health. In Asian countries where they grow in abundance, goji berry juice and teas are commonly taken with meals. The population in these areas tend to have longer life spans and less heart problems in comparison with other regions of the world where such a diet does not exist . Their benefits to heart health result in the natural vasodilators present in the berry. Vasodilators are also a good treatment for sexual dysfunction in both males and females . As studies show, the beta-sitosterols in goji berries also decrease LDL cholesterol absorption in humans by up to 42.8%. . Even though beta-sitosterol is similar to cholesterol, it is metabolized in the human body very efficiently. Cholesterol often remains in the system when it is ingested in excess and cannot be broken down further, however beta-sitosterols are converted almost completely into cholic and chenodeoxycholic acids by the liver (or by bile) and are easily broken down during cellular metabolic processes  . Timpangos Nursery. "Growing Goji Berries." timpangosnursery.com. 2004. Timpangos Nursery. 5 Mar 2009 . "Gogi Berry." A miracle of food-from the valleys of the Himalayas. 2005. UncleHarrys.com. 5 Mar 2009 . Scott, Jeff. "Reviews of Scientific Research about Goji juice, Goji berries, or Lycium Barbarum." Goji Scientific. 2007. 5 Mar 2009 . Mendell, PhD., Earl. "Goji and Cancer." The Goji Cure. 5 Mar 2009 . "Beta-sitosterol." Phytochemicals. 5 Mar 2009 . Dash, Phil. "Apoptosis." Reproductive and Cardiovascular Disease Research Group. 2008. British Health Foundation. 5 Mar 2009 . "Men's Health." Prostate Gland Enlargement. 2007. 5 Mar 2009 . "Goji Berries: Health Benefits and side effects." webmD. 2009. 5 Mar 2009 . "Complete Beta sitosterol Information." Drugs.com. 2009. 5 Mar 2009 . "Showing metabocard for Beta-Sitosterol (HMDB00852)." HMP. 2009. 5 Mar 2009 . "Himalayan Goji Berries." Astrologyzine. 2006. 5 Mar 2009 .